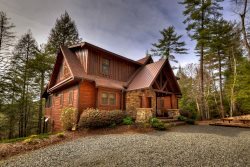 Located minutes from Downtown Blue Ridge in the Aska Adventure area. This beautiful mountain view vacation home has everything you are looking for. Pull up in the driveway to Aska Lodge and immediately feel the relaxing sensation that the mountain area wraps you in. You'll notice first, an outdoor fireplace perfect for cozying up to and making memories. Inside, you will find the prow front showcases the view from the kitchen, dining and living room. Or you can cuddle up on the couch and watch a movie or "the game" on the 46" flat panel TV. Cooking has never been more pleasant than with a fully-equipped kitchen and a mountain view. It's easy to enjoy the vacation with your whole family with 3 bedrooms and bathrooms to choose from, one on each level for maximum privacy. On the lower level, get competitive in the spacious game room which offers entertainment and relaxation for everyone. Outside living is maximized with covered outdoor fireplace and hot tub, perfect for soaking in and taking time to breathe in the fresh mountain air. Secure the perfect set up for your next Blue Ridge Vacation at Aska Lodge! Covered wood burning outdoor fireplace. Covered hot tub on lower deck. Staff is truly amazing, always friendly and accommodating. Third year using u guys and its always amazing. Have already recommended you guys to tons of people. The views are much better than in pictures! The cabin is very spacious and the fireplace is truly awesome! So peaceful and close to the town. We loved the cabin and everything about it was perfect! Would definitely stay again. Great property, private and yet close to town. Very relaxing and I would not hesitate to recommend Aska Lodge. Looking forward to a return visit! Excellent! We didn't want to leave! The staff are exceptionally friendly and helpful. After checking in, we received a phone call the next day to make sure everything was good. Very down home and professional. The cabin and view are gorgeous. We thoroughly enjoyed our stay. The outside fireplace was a favorite for gathering. We also enjoyed playing board games available. Just an overall wonderful family place. The staff was amazing and very friendly. They called to check on us the day after we checked in just to make sure we were happy. Could not ask for better customer service. The Aska lodge was truly amazing. The view from the living room window was beautiful and the sunset coming over the mountain was breathtaking. The cabin was very clean and well taken care of. My only recommendation would be a new mattress or a nice mattress pad for the master/upstairs bedroom. It was very firm. I would stay here again in a heartbeat! The people I had contact were awesome! Everyone was very friendly and accommodating when we needed to change our cabin to a pet friendly one because we needed to bring our dog along. Very nice and relaxing place. I loved waking up and seeing the mountains in the morning. It had all of the amenities of home. It was my daughters first vacation in the mountains and she loved it. Definitely will be back and recommend to my friends and family. We loved the pool table in the game room. For safety and security, there is a camera on the driveway area leading up to this property.